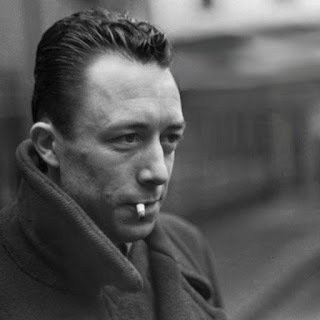 I was thinking this morning about the role of the absurdity of human life in the existentialism of Sartre and the absurdism of Camus and those around and influenced by and influencing them. 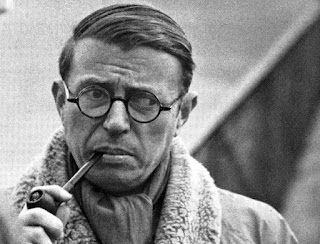 At least for Sartre and Camus, the non-existence of God plays a large part in the account of absurdity. Because there is no God, there can be no objective meaning to our lives. Because there is no objective purpose—and because all our plans and accomplishments come to an end with our deaths and disappearance into nothingness—our lives are absurd. They serve no purpose. And, we are, at best, like dear old Sisyphus. But, can we hold onto this kind of absurdity for more than a moment, if we avoid the modern trap of seeing ourselves as atomistic individuals? (I’ll merely mention here that there’s also something precious and luxurious in this flavor of concern with absurdity.) What I mean is just this: My life undoubtedly appears or is absurd if it begins ex nihilo—in effect, though not in fact—with my conception or birth or first choice and ends wholly and finally at my death. Leaving aside questions of religion and survival, this is an extremely impoverished idea of a human being or life. Regardless of whether there is a God or whether I go on in some personal way after death, I am part of something larger than myself. I come from a family and a community and I contribute to at least one of those in ways that will continue after I am dead and long-forgotten. I’m unlikely to be remembered for long, but even if that’s correct, some almost-almost-indiscernible effect of my having been here with remain in what does remain. If that’s right, the idea that my life is absurd or a cosmic joke is harder to maintain. We live in a time when people get upset about a lot of things. People always got upset (or, outraged) but we share it more often, so maybe we're just more aware of others' grievances and griping. Sometimes the increase in anger may be a good thing; there were many intolerable things that people were made to tolerate for too long. Sometimes we may just be addicted to the outrage itself; some sorts of upset are really silly at best or nefarious at worst. At the moment, some corners of the world are upset at the appearances of the Queen's Christmas address. The problem is supposed to be the opulence of the setting and the golden piano in the background in a time of inequality and unease in Britain and the world in general and, of course, in a speech in honor of the poor Babe of Bethlehem. On the other side, people are saying that, of course the Queen is wealthy, and that without such display tourism would fall and the point of the monarchy would, in some important senses, be lost. One such defense the other night got me thinking about the broader implications. The comparison was to the "stripping of the altars" that occurred during the Reformation. My initial response was to say that it mattered that in this case we have a secular rather than religious stripping, and that matters. That response might have been to quick, though I think something almost like it is correct. There's a common kind of argument made, usually by atheists or agnostics or certain types of utilitarians, that concludes that it is manifestly unjust, for instance, that there are great treasures in the Vatican while there are people who are starving. The claim is that all these goods (the Pietà, Bernini's baldacchino, St. Peter's itself, ...) ought to be sold and the proceeds given to the poor. If taken to its logical conclusion—and uncolored just by anti-religious feeling—this argument should also mean that all museums should be emptied. The Louvre also should sell the Mona Lisa and give that money to the poor. In that latter case, we tend not to draw that conclusion. I think we're right not to. We don't for two related reasons: 1)We think that there is a common good that is served by keeping great artworks available for the public; and, 2) We think that art has a value beyond just the economic or what the economic value could do to help even the worst off. There's a little bit of "you will always have the poor with you" about it. But those two reasons apply also in the case of the Vatican's treasures or those of any beautiful church or synagogue or mosque or temple. The beauty is shared among many more people than could ever appreciate it were in private hands and—at least for the believer—there is a transcendent value; it points to something beyond. For what it's worth, I think it can be seen to point to something beyond even for the non- or other-believer, if only the Kantian sublime. All art, of whatever sort, is extravagant and profligate. So, what about the Queen and her art and golden pianos and all the rest? It depends entirely on what we think the Queen is. If she is just a person, then there can be little question that her wealth is obscene. If, instead, she is the Crown or the embodiment of the same, something that not only transcends the particular individual but also transcends the citizens over whom she reigns and something whose beauty or wealth or existence or style-of-life can be enjoyed either vicariously or as spectacle by many, then there's nothing out of sorts about her pianos or pictures or palaces. I'm not saying that the Queen does play this role, nor am I defending her lifestyle—or that of popes or cardinals or presidents or anyone else—but I do think we can oversimplify these cases in ways that ignore the complexities of our relation to institutions and values beyond the utilitarian or, even, beyond the merely moral. There's a woman in my neighborhood I call "the Rottweiler woman." She lives near me, but she doesn't have a home. She lives on the street, napping during the day in a parking lot near a pharmacy and grocery store and storage facility, and sleeping in entryways of banks or the patio of a coffee shop. She has a unit in the storage facility, so she's able to change clothes and keep some goods. She must get some sort of disability or social security or other form of income. She's able to keep body and soul together. She neither begs nor scavenges. At least, I've never seen her doing either. I call her "the Rottweiler woman," because she has the sweetest—he's also a bit scary if you don't know them—middle-aged Rottweiler. She also has a beautiful parrot who lives in his cage on her cart. She loves them and feeds them and grooms them. The Rottweiler sleeps beside her on the ground when she's napping or bedded down for the night. He watches over her and protects her, as any dog would do. The Rottweiler woman isn't visibly more ill than most of the people I see every day, though I don't know all her problems or history. She reminds me of people I knew and worked with in the year between university and grad school, when I volunteered at a clinic for the homeless and a soup kitchen. So many of those people were just on the edge of keeping their lives together. They could make it if they got the right sort of support, but if too many demands were put on them, things would fall apart. I don't know if that's her situation or not. I talk to her regularly. We talk about our dogs and she lets me see glimpses of her past, but it's not my place to pry. I hope I do get to know more about her, maybe even her name. Yesterday, I stopped to talk to her as she was eating her lunch and I was on my way to mine. We chatted for a few minutes about her dog and the younger of mine and injuries they've suffered. She talked to me of the efficacy of her prayers in the past. And, she apologized for taking up my time, as if my time were more valuable than hers or she wasn't worth human interaction. (It's perhaps worth noting that she doesn't seem to have a network of other homeless people as many on the streets do.) As I left my lunch, she was still on the patio and I chatted a little more. Her dog came to smell my pants, picking up the scent of my dogs. She apologized again. 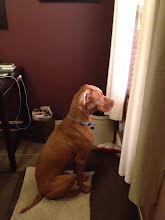 As I was leaving, she chided the dog softly for not letting her talk to people. I don't have some overarching point in this story, except to remind myself and whoever might read this of two things: a society in which people live on the streets is objectively a bad society (this is something Plato recognized in the Republic) and those people who live on the streets are people. There is a tradition in at least some forms of Buddhism to see the Buddha-nature in everyone you meet. There is a tradition in at least some forms of Christianity to see Christ in everyone you meet. There are, I take it, similar tropes in other religions and traditions. I think they get something both very right and a little bit wrong. What they get right is to see the inherent value in every human being—that kernel of Kantian dignity that Schopenhauer couldn't find—and I think it is all too easy to look past certain people—the homeless, the suffering, the elderly, the disabled, the unloved, the discriminated against, the stranger, the poor, the prisoner—and by averting our eyes deny them their dignity and their place in community with us. I'm not sure the right way to do this is by seeing Christ or Buddha in them, though. That's too abstract, too mystical. We need to see the them in them, the particularity, but also the value in that particularity. I think a lot about loneliness. I think it's perhaps the defining characteristic of human life. Maybe it's not the only one. Maybe it's only a characteristic of a certain kind of modern, deracinated life. But, we are the kinds of beings who need connection and, I think, we're the kinds of beings who realize that we are individuals. That is, we are self-conscious in a way other animals don't seem to be. I'm lonely and I'm surrounded with people much of the time. These are people who are required to pay me respect and attention. I go home to a comfortable home—I live in comfort while others live on the streets—and I have a husband who loves me. And, there are the two dogs. We have a duty not only to see the dignity in others, but to bridge our divides and help the lonely to be less lonely. To help all of us be, at the least, alone together. Or, as EM Forster had it, to "Only Connect." Another semester draws to a close. In the brief time between the last class and the deluge of assignments and exams to be graded there's space for reflection. What did I do well? What did I do poorly? How did I connect and fail to connect with students and their concerns and needs? I tend to focus most on the ways things haven't gone well. I'm usually better at thinking about failures than I am successes. Imposter syndrome—assuming it's a syndrome and I'm not really an imposter—also has a role here. This post isn't about being maudlin, though. There's a lot more end-of-the-year reflection to come and much of that will be penitential in nature. Instead, I want to say a couple of things about the beauty of doing what I do. I don't know that I'm a great teacher. I know I get things wrong. I know I can bore students. I know I care deeply about things that don't interest them. I said this wasn't going to reflect on my failings, so I also know that I get to interact with young, creative, reflective, curious minds. I don't know how much of an impact I make. I don't necessarily think that many of my students will remember me particularly after a few years. Someone I follow on Twitter who teaches theology mused this week on how being forgotten was a sort of blessing; it also requires a certain kind of discipline. But, as Freud noticed, transience enhances rather than detracts from beauty, from value. I hope, though, that some little thing we've talked about or some discussion we've had or some comment one of them has made will rest in their minds or in their memories and germinate later in their lives or careers. Even though I teach one of the more useful parts of philosophy—most of my classes are ethics of one sort or another—it is still part of one of the clearly least useful disciplines. Hell, we even pride ourselves on that fact. So, it's not as if they will be consciously using what we've talked about as they design new vehicles or logistical systems or command troops or make hiring decisions or do whatever it is that people in the real world do. What I know is that every semester my students touch and change me. If there's anything like grace, that's a bit of it. In one of my classes yesterday, we were finishing up our much-too-quick discussion of the basic Buddhist account of the human condition. It’s a class in which students are always asking the right sorts of questions. As I was reiterating the purported relationship between desire or craving and suffering—one that almost appeals to me for Stoic reasons—a student offered the objection that desire can also make our lives better. I had been using as an example the way social media and our exposure to the perfectly curated lives of others can make us unhappy. For instance, I had been arguing, when I see the perfect vacation another has taken or I see the interminable post-gym selfies, I can be made unhappy because I have no such vacation but now I desire it or I think my body doesn’t look as good and my desire to look better makes me unhappy. His response was that, desire at least in the latter case, can be a drive to improvement. Seeing someone else’s success in the gym—though it might also be in a dozen other ways: the publication of their book, a new job, an award—and the desire that follows from it can serve as a goad to effort. That effort itself can lead to greater fitness and the attainment of what one had desired. Surely, in that, there is nothing to cause suffering. He was right, in a way. There is nothing wrong in ambition or desire insofar as it can lead us to the better if not the good. Epictetus says somewhere in the Enchiridion that we ought to strive but we ought to be realistic about what that striving will cost us and how likely it is that we might fail (and how we will feel if and when we do). There remains another problem, I said, and that’s impermanence. Now, I’ve been thinking about this a lot recently because I injured a shoulder almost three months ago and, though I think it’s finally on the mend after a late trip to the doctor, it has caused me no end of problems physically. And, because the gym plays the role of therapist for me—it is the one hour of the day when I feel totally in control and where I feel like I achieve something—it has caused me quite a bit of emotional distress. It’s not good to be the not-funny kind of obsessive-compulsive. Whatever your desire leads you to achieve won’t last. The better body will fade with age. The book will be forgotten or surpassed. The next promotion might not come. You will die. What’s the answer? To enjoy what you have while you have it and even when you’re striving, I suppose, but not to be so attached that you will suffer when it’s gone, or in the case of love to accept the future suffering as part of the enjoyment now. Is that possible? Dunno. Anyhow, the student had been concerned that the outlook was too pessimistic. I probably took it further. Tomorrow, for what it’s worth, Hobbes, Schopenhauer, and Ecclesiastes are on tap. Always uplifting! Drawing on Nietzsche and his own harrowing experiences in the concentration camps to which he lost his family, Viktor Frankl re-emphasized the importance of finding meaning of some sort in order to survive. We are meaning-needing creatures. I don't know that this is unique to us. Domesticated animals, at least, can become listless, bored, and depressed without some directed activity. Most of us have also seen animals in the zoo pacing a dirt-path in their enclosures perhaps because the activity toward which their lives would normally be directed or devoted have been taken from them. What I've been puzzling over recently is the difficulty of giving meaning to an object. The pebble for instance has a meaning that I gave to it, but I wasn't able to do that as a pure act of the will. It should be clear that I'm playing loosely with the notion of meaning, thinking about denotation and connotation and various other members of the family of meanings, but it seems to me in any case, an individual isn't enough to give something meaning. There's Wittgenstein's private language argument in the Investigations—unless there is no such argument to be found—but there's also a more general sense in which I think one individual cannot create meaning out of whole cloth. The pebble has the kind of meaning it does for me because of some of its own characteristics (shape, color, etc.) and the context of its being found by me while walking my dog Mateo and the subsequent events of Mateo's death shortly thereafter. None of these is sufficient for it to have any kind of meaning; though a human is necessary to give meaning even if—as in this case—the meaning is in a sense private—a meaning only for me—I don't think I could give whatever meaning I wished to whatever object or word or experience just by an act of the will, by fiat. That's the sense, it seems to me, in which the perhaps-illusory private language argument is correct: no individual by herself is sufficient to create meaning, because meaning has to be answerable to some other constraint in order really to be meaning. Even in the case of language, I'm not sure that constraint has to be another language user. I left Darren Aronofsy’s new film mother! with a lot to think about. Don’t worry, this isn't going to be a movie review; I have neither the interest nor the chops needed to provide one of those. A lot of people I know and respect hated the movie and I understand why one would have that response. 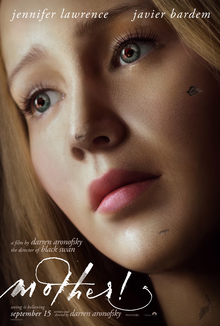 Among its failings has to be counted a marketing campaign that positioned it as a horror film. While horrifying, that isn’t what it is. I liked it—I might want to say I loved it, but, as with really difficult theater, I’m not sure that’s quite an emotion one can sustain toward this piece. I suspect it’s a movie that, in spite of its high-powered cast might have been better placed in arthouse cinemas than the AMC cineplex I saw it in. It has more in common with a move like Almodóvar’s The Skin I Live In than than IT. When we were walking back to the car, Fernando noted the way it felt like a story by Cortázar. That, too, seems right. The movie’s best (or maybe, most easily) seen as an allegory. As with the best allegories, it operates at different levels. At the most obvious level, we have a stark and unsympathetic retelling of Christian salvation history with its Garden of Eden, Fall, the murder of Abel by Cain, Incarnation and Redemption, and even Apocalypse. A student told me that he thought the movie “tried too hard,” and maybe the allegory is a little on the nose at this level. I don’t think so, but opinions may vary. At another level, though, Bardem is not God—nor even the lesser creative mind he might represent at yet another level of allegory—but instead might represent any one of us. He stands for a perennial facet of the human condition that finds more expression in our world of immediate and total connection. Bardem’s Him has someone in Lawrence’s mother! who loves him completely. She lives for Him, has created a world for Him, serves Him, and, as we see, is willing to die for Him and give Him her love as her ultimate gift. Only her child is able to compete with Him for her devotion. Alas, it is not enough. As Bardem’s character says, “It is never enough.” That’s not a situation peculiar to a God who creates a world in order to be loved and who wants even the worst of His creatures to love him. It’s a situation many, if not all, of us find ourselves, one that’s exacerbated by the connectedness of our world. As much as Him, I find myself searching for the approbation of people I barely know or who merely barely know people I barely know. Too often, I do that at the cost of appreciating and returning the real love and affection of those few who are closest to me, those few who invest their energies and lives in me. That’s not new. As long as there have been crowds, we’ve looked for the superficial and fickle love of the crowds over the deeper, more constant, and therefore more real love of our true intimates. No matter the axiom, the birds in the bush are more attractive than the one in hand because they are yet to be captured. For the first time in human history, however, most of us in the technologically advanced world have the real ability to chase a crowd. An insignificant fellow like myself could never have gathered more than a handful of people around himself before the last decade or so. Now, I can reach out to scores or hundreds of “followers” or “friends” on Facebook or Twitter or Instagram or Snapchat or whatever will come in their wake. Because their approval, their likes, their retweets, their shares are outside my control, it can be tempting to work harder for them than I ought. It can be just as tempting to overvalue them, to be too buoyed when I get them and too hard hit when I don’t. The energy, whether positive or negative, that’s expended and created in this chase can only come at the cost of other social interactions. Whatever else might be said about me—about us—our emotional capacities are limited. To paraphrase one of Nietzsche’s criticisms of Christianity for another purpose—I think I’m getting this right—he who loves everyone, loves no one. Or, as Aristotle had it, one cannot have more than a few friends and expect them actually to be friends. In chasing a million interactions as though they were the most important, I run the risk of losing the ones that are most important. In making sure than I’m not alone, I might just end up that way. That might just be me, but I think it might also be a more general truth.